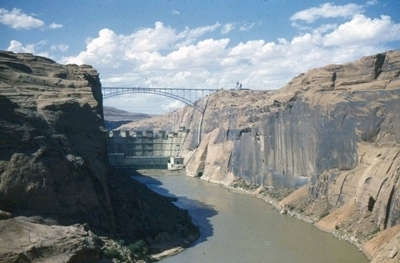 Along the Colorado River, there are many dams that are necessary for civilization in the desert. They also provide a variety of recreational activities. In this article, we are going to go over the dams along the Colorado River in Arizona and the history behind them. First up is Glen Canyon Dam. Glen Canyon Dam is the second largest dam along the Colorado River and lies in Page, Arizona. Its main purpose includes generating electricity and providing desert cities with water, as with all the other dams. Glen Canyon Dam is part of the Colorado River Storage Project for the Upper Colorado Basin. “The project furnishes the long-time regulatory storage needed to permit the states in the upper basin to meet their flow obligation at Lee’s Ferry, Arizona, (as defined in the Colorado River Compact) and still use their apportioned water,” says the U.S. Bureau of Reclamation, the operator of the dam. Construction began in 1956 by Merritt-Chapman & Scott, the industrial conglomerate. The dam began blocking the flow of the Colorado River in 1963 but was not dedicated until 1966. In 1980, 17 years later, Glen Canyon Dam finally blocked the river enough for Lake Powell to reach its maximum height. Lake Powell is the largest reservoir in the United States. Glen Canyon dam generates about 451 megawatts of electricity. This contributes to about 6% of the total energy import for Arizona. Utah is given 16% of its total energy from the dam. The dam has the potential to generate 1300 megawatts of electricity but it does not. Glen Canyon dam saves over 5 million tons of carbon dioxide a year. The dam is 720 feet tall and is 1560 feet long. Many states, including California, Arizona, Nevada, and New Mexico get about 8.3 million acre-feet of water every year from the dam. Around 85% of the water passed through the dam/lake is used in irrigation projects; the rest is diverted to urban areas. Next up is Hoover Dam, which is located 30 miles southeast of Las Vegas. Once called Boulder Dam, Hoover Dam lies in the Black Canyon section of the Colorado River. Hoover was once the world’s largest hydroelectric power generating station and the largest concrete structure, but was passed by the Grand Coulee Dam and is the 38th largest hydroelectric generating station. Construction began on March 11, 1931 by Six Companies, Inc. As they poured the concrete in sections, they realized that due to a chemical reaction in the concrete, it was necessary to circulate cold water through to solidify it. If they did not do this, they estimated it would take 125 years to solidify. To help with this massive cooling process, Union Carbide Corporation was hired. Boulder City was built as a camp for workers. To this day, gambling is still not allowed, just as it was during construction. 96 people died during the construction of Hoover dam and 42 other deaths can be attributed to pneumonia from working in tunnels. Finally, in 1936, the dam was completed. A year earlier, on September 30, 1935, the dam was dedicated to President Franklin D. Roosevelt. Hoover dam was completed about 2 years ahead of schedule. Operated by the U.S. Bureau of Reclamation, the dam is 726 feet high, 1244 feet long, and cost $49 million. Water flowing from Lake Mead reaches the generators at a speed of 85 miles an hour. Arizona receives about 18% of the dams yearly output of 2080 megawatts. Forty-five miles downstream of Hoover Dam along the Colorado River, sits Davis Dam. Davis dam is unlike the other dams along the river. It is an earth zone dam with a concrete spillway. Its main purpose is to re-regulate water coming from Hoover and going down the river. The dam was originally called Bullhead Dam for the nearby Bullhead City, but the name was changed to Davis dam, after Arthur Powell Davis, the director of the Bureau of Reclamation. They have owned the dam since it opened in 1951. The dam has a capacity of 251 megawatts and generates 1 to 2 terawatts of electricity annually. Davis dam is 200 feet high and 1,600 feet long. Parker Dam, the last dam in this article, is 110 miles downstream from Davis Dam. Lake Havasu has the capacity of about 647,000 acre-feet of water, or the equivalent of 210 billion gallons. Lake Havasu is over 45 miles long! Parker Dam is the deepest dam in the world. It is 320 feet high and 235 feet are below the bedrock of the river. The dam was built from 1934-1938 by the U.S. Bureau of Reclamation, who owns the dam. Parker Dam has 4 generators with the capacity of 120 megawatts. However, the generation of power is limited by a requirement to keep the lake levels between 440 to 450 feet for recreational purposes. Lake Havasu is very important to the water supply to Phoenix. Located at Lake Havasu is the CAP (Central Arizona Project) pump. This is the initial source of CAP water. Water is pumped through the Buckskin Mountains and then carried via aqueducts into Phoenix. "Glen Canyon Dam." Wikipedia. Web. <http://en.wikipedia.org/wiki/Glen_Canyon_Dam>. "Hoover Dam." Wikipedia. Web. <http://en.wikipedia.org/wiki/Hoover_Dam>. "Davis Dam." Wikipedia. Web. <http://en.wikipedia.org/wiki/Davis_Dam>. "Parker Dam." Wikipedia. Web. <http://en.wikipedia.org/wiki/Parker_Dam>.